Seagate has launched a new HDD storage portfolio, said to offer the industry's widest range of advanced 14TB hard drives. There are five new lines in all; the IronWolf and IronWolf Pro for network attached storage (NAS) applications, the BarraCuda Pro desktop drive, surveillance-optimized SkyHawk, and Exos X14 for hyperscale data centres. Probably the most interesting of these new products for HEXUS readers are the NAS and desktop tuned 14TB HDDs, the IronWolf/IronWolf Pro and BarraCuda Pro drives, respectively. Seagate says that the IronWolf drives are built with multi-user environments in mind, which allows a workload rating up to 300TB/year allowing users to do more with their data and their NAS. IronWolf drives utilise the AgileArray firmware for NAS servers to optimise for; RAID performance, dual-plane balance, rotational vibration (RV) sensors, advanced power management and error recovery control. Furthermore, customers get the Seagate IronWolf Health Management and 2-year Seagate Rescue Data Recovery Services. IronWolf and IronWolf Pro drives feature a 3-year and 5-year limited warranty respectively. The Seagate BarraCuda Pro 14TB drives are optimised for desktop workstations or direct attached storage (DAS) systems. With their 7200RPM spin speed, along with 250MB/s data transfer rates, powered by up to 256MB of cache and Seagate's Multi-Tier Caching Technology (MTC) these drives are said to be great for data-intensive editing of 8K video or the transfer of large files to an attached backup. 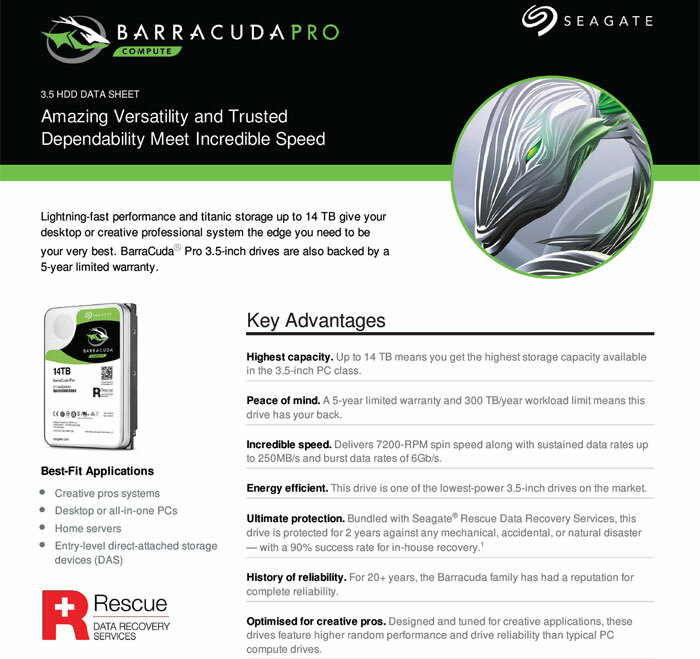 Seagate adds that BarraCuda Pro provides customers with speed, versatility and durability at an affordable cost, as well as the support of a 5-year limited warranty. For surveillance systems Seagate recommends the SkyHawk 14TB. It says this drive can facilitate the storage of over 9000 hours of HD video. These HDDs are tuned for 24/7 workloads, and equipped with ImagePerfect firmware to minimise dropped frames and downtime. Furthermore, SkyHawk drives can store streams from up to 64 HD cameras (or 16x AI video streams) and offer workload rates of up to 180TB per year. Seagate Exos X14 drives are designed for advanced hyperscale data centres with their enhanced areal density in a compact 3.5-inch form factor. Combining great density figures with the industry's lowest power consumption and the best performance in its class, Seagate hopes that Exos X14 HDDs will be attractive due to their maximised storage capacity, while reducing both complexity and operational costs. Exos X14 Helium-based drives also ship in a modular enterprise system (Exos E 4U106) for easy scaling up to an unprecedented 1.4PB density. Buyers of Exos 14 HDDs and systems benefit from 'always-on' Seagate Secure protection (encryption) and a five year limited warranty.